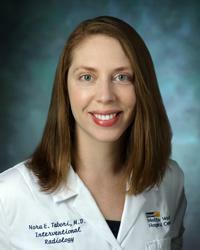 Nora Tabori, MD, is an interventional radiologist at MedStar Washington Hospital Center and a member of the Society of Interventional Radiology. She has previously served as Chief of Endovascular and Interventional Surgery at James J. Peters VA Medical Center and Assistant Professor of Radiology and Surgery at The Icahn School of Medicine at Mount Sinai. Dr. Tabori has also served as an interventional radiology attending in the Inova system with the Association of Alexandria Radiologists. As an interventional radiologist, Dr. Tabori specializes in minimally invasive, image-guided therapy for the treatment of a wide variety of conditions, such as loco-regional therapy for liver, kidney, and lung cancer; peripheral vascular disease, dialysis access management, complex filter retrieval, central venous reconstruction, deep venous thrombosis (DVT), portal hypertension, and uterine fibroids. Dr. Tabori has clinical and research interests in loco-regional cancer therapy, peripheral vascular disease, portal hypertension interventions, and interventional palliative procedures. In particular, she has expertise in advanced techniques for the treatment of primary and secondary liver cancer, limb salvage, and the use of radial artery access for intra-arterial therapies. Increasing the use of radial artery access is of particular interest to her, as it can increase patient satisfaction and comfort in the post-procedure period. Dr. Tabori is widely published on the use of Yttrium 90 (Y-90) therapy for the treatment of both primary and secondary cancerous liver tumors and continues to be active in this area of clinical research. She is also a national speaker on this topic. Dr. Tabori received her medical degree from Mount Sinai School of Medicine and completed a preliminary surgery residency with Lenox Hill Hospital in New York City. She then joined Columbia Presbyterian for a four-year residency in radiology before completing a specialty fellowship in vascular and interventional radiology at Mount Sinai Medical Center. In 2016, she was awarded the Distinguished Educator Award of Interventional Radiology at Mount Sinai. “The reason I chose minimally invasive care is because I want my patients to walk out of the hospital the same day feeling as good or better than the day they got there. I want my patients to recover as quickly as possible so they can return to their lives. With interventional radiology minimally invasive procedures, my patients are typically able to recover within a 24 hour period. “My main objective is to be able to treat a disease while always maintaining and improving my patients’ quality of life. I am extremely compassionate and understanding of what my patients are going through, and I do my best to always make sure they feel like they are cared for, that they understand what is happening, and that they have a choice in the process of what’s going on with their bodies.